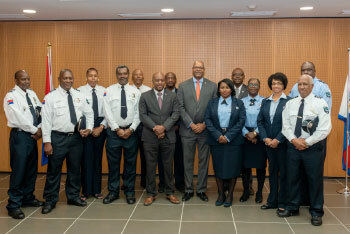 SIMPSON BAY, St. Maarten (Friday, March 22, 2019) - The Honorable Minister of Justice, Cornelius De Weever administered the oath to 12 security officers of the Princess Juliana International Airport (SXM) that successfully completed the extra-ordinary police course (BAVPOL). They were sworn in as Auxiliary Police at the Council of Ministers Hall on March 20, 2019. Chief Operations Officer, COO, Michel Hyman and the Director of Operations Division, Lloyd Hinds both attended the swearing in ceremony to show support for the security staff. “The security officers were elated to be sworn in as Auxiliary Police officers. Executing their tasks with more authority at one of our main entry points should increase our sense of security as well. I have asked them to execute their responsibilities with respect and integrity in the overall benefit of St. Maarten,” disclosed the Honorable Minister of Justice, Cornelius De Weever. Speaking on behalf of the group, the Acting Security Manager of the Princess Juliana International Airport (SXM), Elsidro St. Jago said: “There was much anticipation for the long-awaited swearing in ceremony, since we had successfully completed the BAVPOL course in 2016. Although it took some time, we are grateful to the SXM Airport’s Managing Board for their support and guidance. As we are now given the authority to act as Auxiliary Police officers, we intend to carry this out with pride”. The Justice team is currently assisting the Airport’ Security department in efforts to schedule two additional officers to be sworn in after March 29th. 2019.